Professor Lindsay G. Robertson joined the law faculty at the University of Oklahoma in 1998 after serving as a visiting professor in 1997. He teaches courses in Federal Indian Law, Comparative Indigenous Peoples Law, Constitutional Law and Legal History and serves as Faculty Director of the OU Center for the Study of American Indian Law and Policy. Late June 2014 he will visit Mainz University for a ZIS-Guestprofessorship. 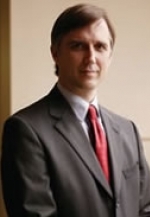 Prior to coming to OU, Robertson taught Federal Indian Law at the University of Virginia School of Law and the George Washington University National Law Center. He was a Research and Visiting Fellow at the Philadelphia Center for Early American Studies from 1992 to 1994. He worked in private practice in Washington, DC, and Charlottesville, Virginia, and as a judicial clerk at the United States District Court for the District of Delaware. He currently serves as Special Justice on the Supreme Court of the Cheyenne-Arapaho Tribes. Robertson is the author of Conquest by Law (Oxford University Press 2005). "Indian Nations between inherent sovereignty and plenary power"